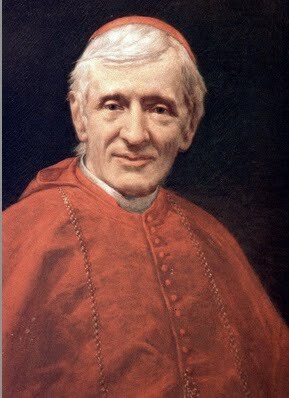 John Henry Newman lived from 1801-1890 in England. In his day he was a cultural critic, educator, epistemologist, novelist, Oxford scholar, philosopher, playwright, poet, preacher, satirist, theologian, and one of the great Victorians (among Arnold, Carlisle and Dickens)… and in ours, a father of Vatican II and a beatified saint on his way to formal canonization. I would like to focus on three reasons why Newman matters for us: the relationship of faith and reason, the purpose education, and Newman as a model of sacrifice. First, is there a relationship between faith and reason? Modernity has not merely divided faith from reason and reason from faith, but has placed a chasm between them. Newman saw this occurring in his own day (just over a hundred years ago). He saw that faith was losing its rationality, it was becoming a sentiment, a mere opinion, a matter of taste, as disposable as your last latte cup. And because of this, faith became a private matter. We can talk about ideas rationally held, but there is nothing to talk about when something is just a matter of preference. Unfortunately, this has come to full fruition in our own day. Because of this divide, we are left with three alternatives: rationalism, fideism, and relativism. Don’t be intimidated by the big words, they are all dumb and wrong. a) Rationalism: Here, reason has an indubitable quality, to know something you must be “certain” about it, there can be no doubts. Anything believed is because there is explicit evidence. Thus, you may hear: “It’s not rational to believe things you can’t see, I can’t see God, so I don’t believe in him.” We encounter this in a sophisticated fashion in academia (especially the sciences), and more simplistically but in the same fashion, by teenagers rebelling against their parents. b) Fideism: This position holds that any knowledge that we have is based on a revelation from God (e.g. the Bible). Thus, religious beliefs have little or nothing to do with reason. Why do we believe something? Because it’s in the Bible or God says so. As a result, people believe things that are absurd, say, that aliens will come and take us away and we will each have our own planet. As young Catholics, we do a good job of seeing the falsehood of the third option. But what is so sad is that we accept the other two alternatives. In so doing, we divide faith from reason in our lives. We don’t actually think that our beliefs are rational. We become fideists thinking that faith is reduced to a blind following (apart from reason). This situation was absolutely unacceptable for Newman. Newman understood, and understood rightly, that faith that is not rational is not true faith. Reason devoid of faith, has stripped man of a capacity for knowledge beyond him. Faith is fundamentally rational. Reason’s greatness is dependent upon faith. Newman writes regarding faith: “[Such is] everyday’s occurrence… we meet [things in the world], not with suspicion and criticism, but with a frank confidence. We do not begin with doubting; we take [things] on trust.” Faith is the ground upon which we stand as we make our way in this chaotic world. We assume things to be probable, we take things for granted, we presume things to be true, and go on applying them. Faith is a principle of action, by faith we act. Newman writes, “Life is for action. If we insist on proofs for everything, we shall never come to action: to act you must assume, and that assumption is faith.” Thus, without faith we have no action and we become passive creatures. From this we see that faith has not only a religious character, but is a part of our human nature. May I give you a relevant example of this natural faith? You are doing it right now. You are reading this article (for the one of you out there that has made it this far), and you believe that I, James Baxter, actually wrote this. You did not see me type it nor did you see me submit it to the Vocations Office. You also believe that I am a seminarian. Why? Well, my picture is on the poster. But have you been to St. Meinrad to ensure that in fact I am here in that seminary the poster says? You believe that this is written by me and you believe that I am a seminarian, and correctly on good and natural faith. You know both of these things to be true, but that does not mean that there are no doubts that can be thought up. Newman writes regarding reason: “by reason is properly understood any process or act of the mind, ‘a spontaneous energy’ by which knowing one thing, we advance on to know another.” Our five senses isolate us to that which we can directly see, touch, taste, smell, and/or hear. But reason takes us beyond this limitation, it enables us to know things indirectly. For example, I can think of our Cathedral, but I am not currently in Lafayette beholding it. Reason is also reflective, it has the power to criticize and analyze. Taking all of this into account, how does Newman practically matter for you? Don’t be fideistic with your faith. The Catholic Church does not call you to believe blindly, this would contradict your nature as rational and free, the very qualities of our image and likeness to God that separate us from other creatures. Now, some things we know by revelation and couldn’t have arrived at by reasoning alone, but that does not mean that they are not rational (e.g. the Trinity). You can answer rationally, why you believe in Jesus Christ. You have many reasons, here are a few: you look to things such as the reliability of your parents and grandparents or other who passed on the faith to you; the desires of your heart for the infinite; the anomaly of Jesus Christ as the only religious teacher to declare He was God; you see that the calendar year being 2013— and you ask 2013 years from what? ; you are humbled by the fact that the Catholic faith demands more of you, that it doesn’t verify all that you think, that it challenges you; you are inspired by the witness of the Saints, many of whom have died defending their faith; you are assured by the fact that Catholicism is currently the largest religion; you are impressed that it is the only religion to declare infallible authority. All of these things converge on one another and enable you to believe (and rationally so) that some 33 year old Middle Eastern man 2,000 years ago saved everyone who has ever lived by carrying a tree to his tomb, which he also happened to rise from. And from this, you can act and give your entire life for Christ. And our universities reflect this way of thinking. We pay some absurd amount per credit hour, fulfill course requirements, and get that glorified piece of paper (diploma) that verifies that we “know stuff,” and whose letters (B.S.) bear witness to the futility of it all… Thus, in the modern world, education is reduced to sheer practicality. What happens because of this? We know a lot about very little, we become people of one idea. We claim to be enlightened, as though the past was full of cave men, yet we are no less violent, no more happy, and doubtfully more intelligent. We are specialists, but we fail to see how our disciplines relate to others. All of the sudden, we see theological claims made by biologists and biological claims by theologians, neither of whom have the authority to make them. We do things (say, drop a bomb) because we can, forgetting to ask whether we should. For Newman, education is not just practical skill equipping, but the formation of a habit of mind; a way of thinking that enables you to see that knowledge is a circle, in which all truths have a home; that shows you that each truth has a direct bearing on every other. A true education expands the mind beyond the mere rote memorization of flashcards to be able to consider new ideas in relation to others already known. All of this is not to deny the importance of specialization (knowledge is advanced this way), but that education is something much fuller than the mere skill equipping exercises found in our universities today. Again, how does Newman’s understanding matter for you? Practically speaking, get less practical. For you scientists, read a novel. For you Lit majors, read some science. For you business men and women, get a soul (just kidding). Learn how what you study affects other fields. See how the teachings of the Church immediately and directly relate to and inform what you study. All truths in all fields unite in the person of the Truth, Jesus Christ. We have considered why Newman matters in terms of understanding the relationship of faith and reason and the true purpose of education. But Newman is also a model of heroic sacrifice. To convert to Roman Catholicism in Anglican England in the 19th century, he sacrificed friends, family, wealth, his reputation and his own mental health. He truly became an exile in his own land. The greatest intellect Oxford had ever seen was banished from its premises. At that time, only “dumb, drunk, potato-eatin’ Irishmen” were Catholic. They could not fathom how, without having met a Catholic, Newman converted on the intellectual coherence of Catholic teaching and by following his conscience. Father David Hasser has gone back to school! Well, sort of. Now that the universities are back in session, he has returned to making his campus rounds. What does he do on campus? Grab a Purvis burger at TripleXXX, go to football games? Some of that, but with a greater and higher purpose. I recently interviewed him in order to find out what it is that he does and why it is important for the Office for Vocations. Father generally spends the weekends in Muncie at the St. Francis Newman Center at Ball State. Then, he makes the trek down to Indiana University on Tuesday, sometimes passing through the southern parishes of the diocese, Marian University and/or IUPUI. He stays overnight at the Newman Center Rectory at IU, then travels north again, this time heading to Purdue for the rest of the week. It’s a lot of driving (about 7-8 hours a week) but he uses this time to pray or for formation through audio sources. Before he even gets to campus, he has his work cut out for him. Making contacts with students and setting up individual and group activities or meetings is the bulk of his “homework” before hitting the campus scene. He does this so that he can build relationships with the students and to be an available presence in order to encourage them and help them in their vocation discernment. Much of this is done around the Newman Centers on campus but isn’t limited to what is available there. In fact, much of his work needs to be done through social media. Students today are very plugged in and it is important that the Office for Vocations is present online as well. Even though the social media tool is a significant part of reaching out, a personal relationship counts even more. Father is available to the students in order that he can build these friendships to connect and understand them in their daily experiences and discernment processes. These relationships are built through the activities on campus—yes, even grabbing a burger at a local hangout on occasion. Getting out of the office aids to focus on the individual, to break out of the stereotypes or presumptions that people have about religious life or priesthood, to get to real conversation about vocations, beyond what is available in a pamphlet. In fact, many of our current seminarians accredit their personal relationship with the Vocations Director, past and present, and/or other seminarians for their discernment towards beginning seminary. Father aims at being relatable to the students, while always professional in keeping with his priestly office. While it’s not always possible to meet with each student individually, this time on campus and Father Hasser’s presence at activities at least lends itself to having familiarity with him, “a face with the name”, for when young men and women have questions about their vocation. It seems to be common that the young people often begin to discern when they are away from home and the comforts of their home parish and home activities. Many people don’t go to their childhood pastors with questions of discernment—it seems that this is a relationship that almost has to be rebuilt or re-established to allow breathing room for their discernment and for active discussion. Often the Vocations Director helps with this by his availability and openness, his presence on campus where the person is undergoing a process of self-discovery while away from home. Often Father Hasser encourages the young person discerning to reconnect with the priest at his or her home parish who has known him or her for a longer time. I asked Father about the short and long-term goals of these campus visits. He said that the short-term goal is to increase the number of students from our Diocese that he can meet and with whom he can build relationships. The long-term goal is to help the priests in our Diocese actively invest in their college-aged parishioners who are away. So far he sees that the visits have borne fruit, in that relationships have been established, seeds are planted and nurtured, discernment is occurring. He is also helping with education, catechesis and awareness about joyful vocations. A final thought that Father Hasser added was about discernment in general. He said that our human nature desires to understand the reality in which we live: we desire to understand who we are, where we come from, where we are going, what our gifts and talents are and how the Lord invites us to make ourselves a gift for others through words and deeds. Discernment is the activity of asking these questions of the Lord and seeking answers that will enlighten our perspective on life. He says that discernment is deeply personal and revealing of our inmost being. It requires a lot of vulnerability and courage, adventure and stamina, assets and forfeitures. When young people finally want to ask for help and guidance in their discernment, they will first look for a relationship in which they can put their trust. A relationship of virtuous trust isn’t something that is readily available or bought, rather something that is shown and proven through time in tangible ways. The activities and schedule that Father Hasser follows is an attempt to show this to the students, to prove his virtuous trustworthiness to as many of our potential discerners as possible. That is why he does what he does. 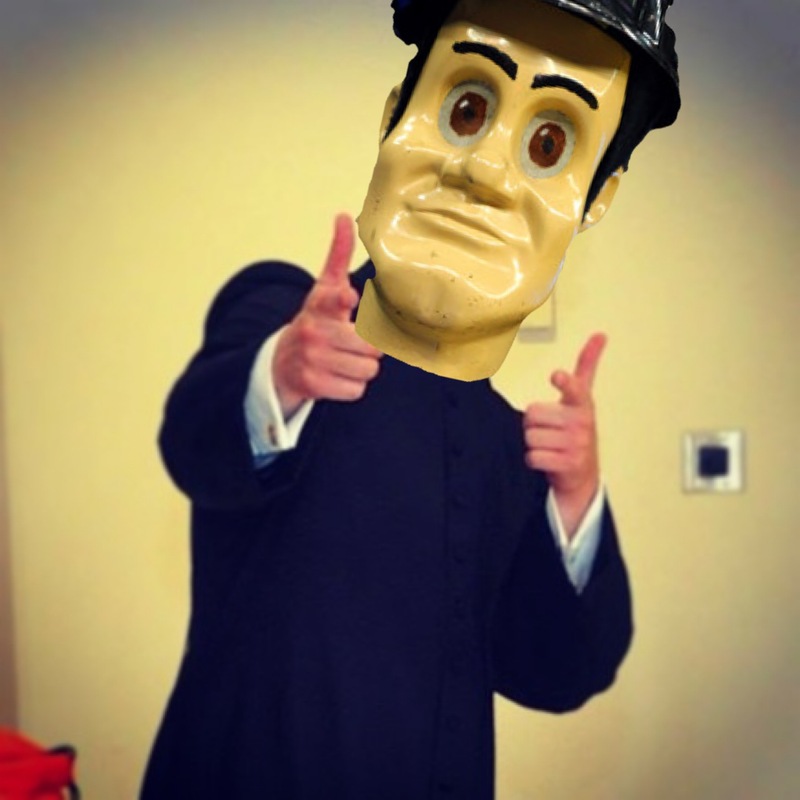 As a final note, there is something that YOU can do to aid Father Hasser on his campus visits. Encourage the college students from your parish to be actively involved in the Catholic communities on campus and to even find Father Hasser. It is often easy for the young people to slip through the cracks and become inactive while at college, due to many other academic and social commitments and activities. We, as a community, desire that none be lost. You may give a contact email to Father Hasser so that he can try to meet up with the student and visit with them while on campus, or give Father’s email: frhasser@priestforever.org to students while they are off at the university. And of course, prayer is always helpful too! Thank you in advance for your help in this important ministry!